It’s the cutest little corner coffee shop located between Euljiro Station and City Hall, on a block that seems almost frozen in time. I can imagine the hustle and bustle of workers placing their orders at the window early each weekday morning, and then the calm and slowness on Saturdays when the city has cleared out for the weekend. Then again, we went on a Saturday, arriving just as the barista was putting out the signs and benches, and there were at least three other Saturday morning coffee-drinkers already waiting to take theirs to go. 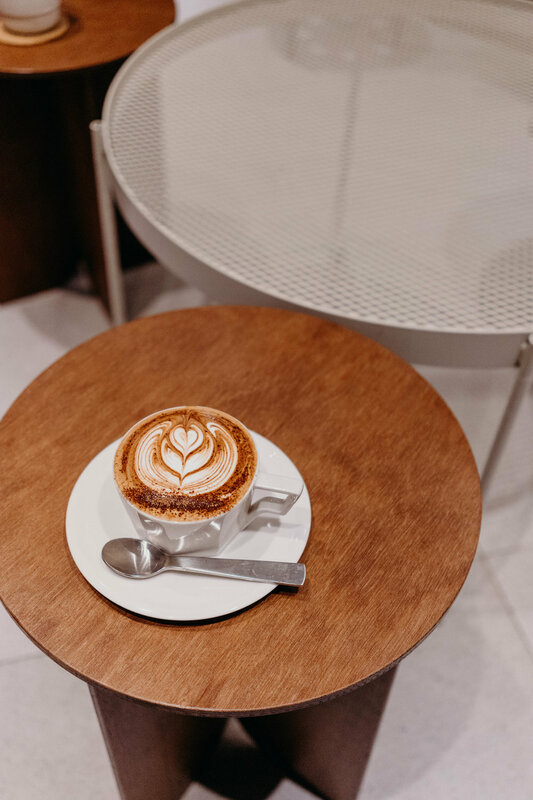 I love its old-school vibe (you should see the kimbap shop next door) and relatively low prices for exotic drip coffees (though any drip coffee is exotic in Seoul—Andrew often settles for an Americano). Coffee drinks are exorbitantly priced here, so an exotic drip coffee and my drink, the dark Belgian mocha pictured below, for under $10 is reasonable. Also, mine was pretty. Reason enough. We sipped slowly, chatting about our life plans post-Seoul, mostly jokingly contemplating what our own coffee shop would look like if we opened one. If you’re a local, be sure to sign up for their points program! Follow our hashtag on Instagram for more #onthestreetsofseoul!